From Deepak Malhotra and Max Bazerman, two leaders in executive education at Harvard Business School, here are the frameworks, strategies, and tactics you need to achieve outstanding results in any negotiation. Whether you’ve “seen it all” or are just starting out, Negotiation Genius will dramatically improve your negotiating skills and confidence. 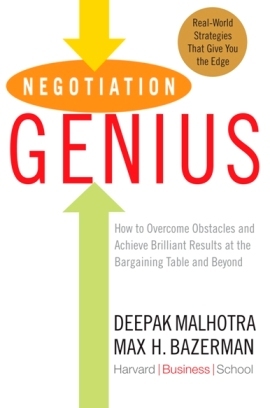 Drawing on decades of behavioral research plus the experience of thousands of business clients, the authors take the mystery out of preparing for and executing negotiations—whether they involve multi-million dollar deals or improving your next job offer. > And much, much more. This book gets “down and dirty.” It gives you detailed strategies—including talking points—that work in the real world even when the other side is hostile, unethical, irrational, or more powerful. When you finish it, you will already have an action plan for your next negotiation. You will know what to do and why. You will also begin to build your own reputation as a negotiation genius.